conference in Toronto, Ontario, Canada. The California Fair Political Practices Commission (FPPC) announced on September 23 that it has opened an investigation into the California Democratic Party in response to a report by a prominent consumer group claiming that the party acted as a “laundry machine” to funnel donations from oil, energy and utility companies to Brown’s 2014 election campaign. She said the FPPC will not not be opening an investigation into “the other persons,” including Governor Brown, identified in the complaint at this time. West said Consumer Watchdog will next receive notification upon final disposition of the case, but didn't provide any time frame for the case’s disposition. “However, please be advised that at this time we have not made any determination about the validity of the allegations you have made or about the culpability, if any of the persons you identify in your complaint,” she said. “The Party and members of the Administration who worked for it have a lot of questions to answer. Political parties shouldn’t be used as laundry machines for money from unpopular companies or for campaign contributions in excess of candidate-permitted limits,” he stated. Consumer Watchdog released Brown’s Dirty Hands on August 10, 2016, at a time when Brown faces increasing criticism from environmental, consumer and public interest groups regarding administration policies they say favor oil companies, energy companies and utilities over fish, water, people and the environment. The report tabulated donations totaling $9.8 million dollars to Jerry Brown’s campaigns, causes, and initiatives, and to the California Democratic Party since he ran for Governor from 26 energy companies with business before the state, according to Court. The companies included the state’s three major investor-owned utilities, as well as Occidental, Chevron, and NRG. “An exhaustive review of campaign records, publicly-released emails and other documents at PUCPapers.org, court filings, and media reports, showed that Brown personally intervened in regulatory decisions favoring the energy industry, and points to Brown and his operatives having used the Democratic Party as a political slush fund to receive contributions from unpopular energy companies in amounts greater than permitted to his candidate committee,” Court said. State law limits the amount that individuals, businesses and committees can contribute to political candidates. In the 2014 election cycle, a single donor was limited to $54,400 for a candidate for governor, according to Tucker. However, donors can give unlimited amounts of money to political parties. During the 2014 cycle, parties were allowed to give up to $34,000 from each donor to a candidate per year. In one of many examples of the alleged use of the party as a “laundry machine” for political contributions to Brown cited in the report, Chevron donated a total of $350,000 to the Democratic Party on December 23, 2013. Seven days later, the Democratic Party donated $300,000 to Brown for Governor 2014. On the same day Chevron donated the maximum to Brown’s campaign, $54,400. Following an ethics complaint filed by Consumer Watchdog against McFadden, the FPPC on March 24 opened an investigation into her failure to report the dates and times of stock sales in PG&E, her former employer. Tucker said she was pleased that the FPPC was continuing their invesvtigation into McFadden. “It’s a very good sign that the investigation is still open,” she said. • “Southern California Edison donated $130,000 to the California Democratic Party, its largest contribution up until that time, on the same day PUC President Michael Peevey cut a secret deal with an SCE executive in Warsaw, Poland to make ratepayers cover 70 percent of the $4.7 billion cost to close the fatally flawed San Onofre nuclear plant. Brown backed the dirty deal, telling Edison’s CEO personally, according to an email from the CEO uncovered by the Public Records Act, that he was willing to tell the media on the day of the plant’s shuttering that the company was acting responsibly and focused on the right things. Three days prior to SCE’s announcement that it would close San Onofre permanently, the company donated $25,000 to the California Democratic Party. As this FPPC investigation proceeds, the big corporate money behind Governor Jerry Brown's controversial environmental policies is facing increasing scrutiny from public trust advocates. November 4 will be the second anniversary of the passage of Proposition 1, Governor Jerry Brown’s controversial water bond, a measure that fishing groups, California Indian Tribes, grassroots conservation groups and environmental justice advocates opposed because they considered it to be a water grab for corporate agribusiness and Big Money interests. 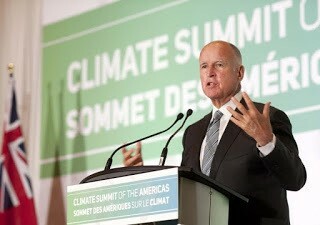 While Jerry Brown often receives fawning coverage from the mainstream media when he appears at climate conferences in California and across the globe, his policies on fish, wildlife, water and the environment are among the most destructive of any governor in recent California history. The Governor’s “legacy project,” the Delta Tunnels/California Water Fix, poses a huge threat to the ecosystems of the Sacramento, San Joaquin, Klamath and Trinity river systems. The project is based on the untenable premise that taking more water out of a river before it reaches the estuary will somehow “restore” the San Francisco Bay Delta and its precious fish and wildlife species. Above photo by Salvatore Sacco, Canadian Press Images.